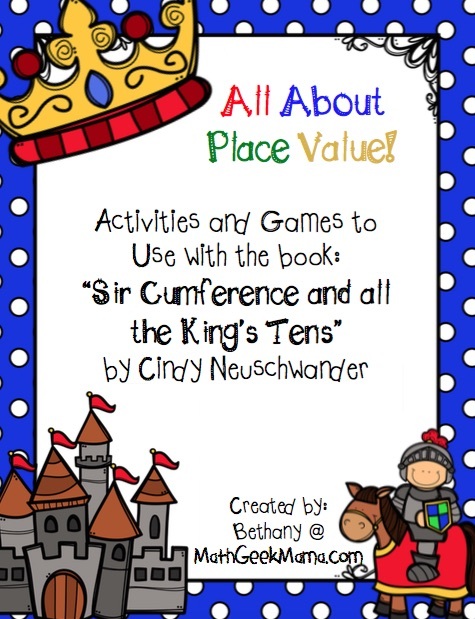 FREE "Sir Cumference and All the King's Tens" Activities! Have I mentioned how much I LOVE teaching math with engaging books? Well I do! 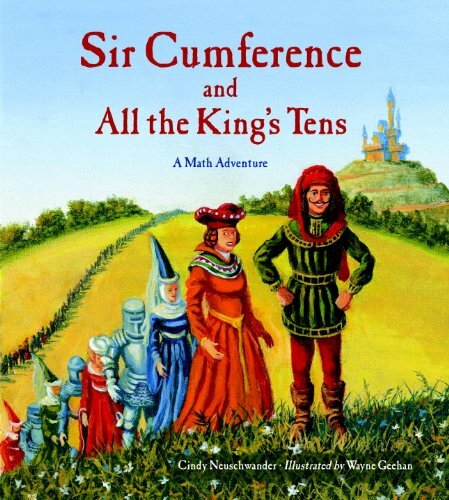 And some of my favorite stories are the “Sir Cumference” books by Cindy Neuschwander! All of these books weave important math ideas into a story that captures kids’ attention. 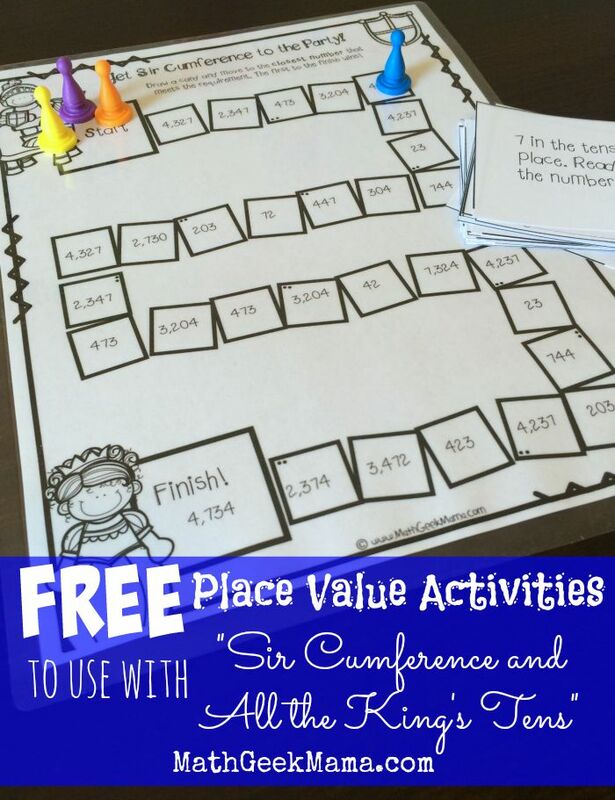 Today, I’m sharing FREE Sir Cumference and All the King’s Tens Activities, including an easy print and play place value game! While the other “Sir Cumference” books that I have shared so far cover geometry concepts, this book focuses on place value and understanding large numbers. 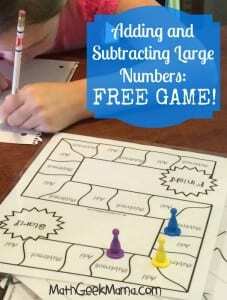 In addition, it helps show kids strategies for counting or adding large numbers without counting single units. After your initial read-through with your kids, you might want to have them go back through and record all the different groups that arrive to the party and then add up the totals. Or have them draw their own visual representation of the different place values and explain what that means in their own words. For example, in the story, there are different sizes of tents to represent the different place values. 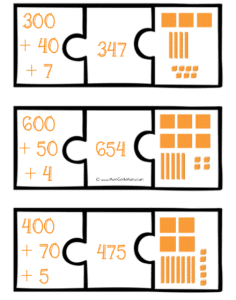 I would also recommend playing around with base ten blocks to let them “read” and “build” various numbers. For example, build a number with blocks and see if they can tell you what it is, then call out a number and see if they can make it. You could even each build a number with the blocks , and then have them determine which number is larger! 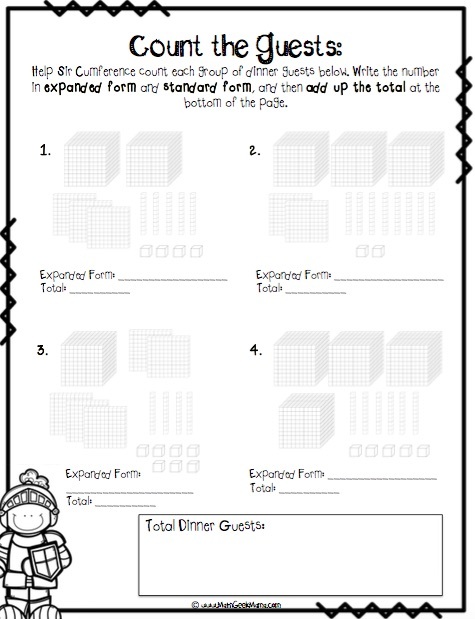 Then, move on to the worksheet included in this download, which has different pictures of base ten blocks to represent groups of people coming to the party. Writing the numbers in expanded form first helps show the connection between a numbers place and it’s value. For instance, in the number 2,365 the value of 2 is not just 2, but 2,000. It’s essential for kids to make that connection! After writing each of the numbers, students are asked to find the total number of guests. There are a couple of ways to do that, so don’t be too quick to show students a particular method. Let them work it out themselves, and then ask them to show how they know it’s correct. (Note: An answer key is provided in the download). 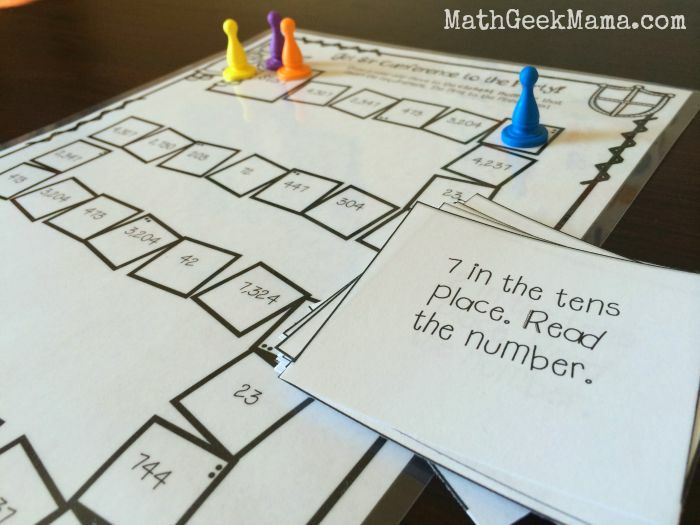 Also included is a place value game to help kids recognize the different places and correctly read large numbers. All you need to do is print the game board and cards, cut out the cards and find some game pieces. I would recommend laminating the game and cards for durability, but it’s not essential. All players begin at “start” and draw a card. 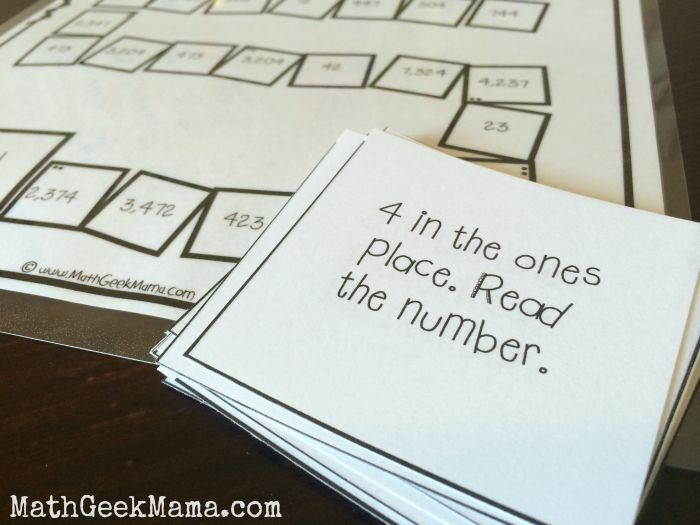 They then move to the closest number that meets the criteria on the card (not moving backwards), and read the number out loud. Players take turns drawing cards and moving around the board until someone reaches the final number on the “Finish” space. There are a few “move backwards” or jump to the next number twice cards as well. So if the card says, “4 in the ones place (TWICE)” they would move to the next space with a 4 in the ones place, and then move to the next space with a 4 in the ones place. 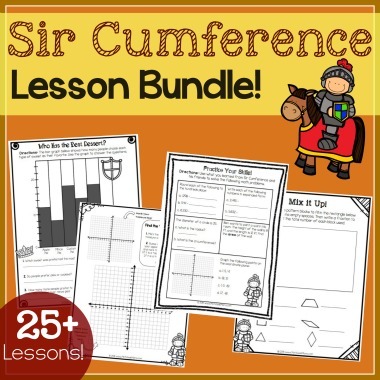 Want these fun and FREE resources to use with Sir Cumference and All the King’s Tens? Just click the link below! 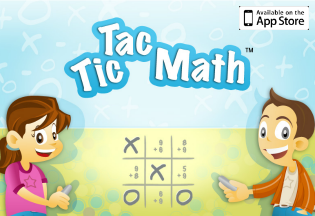 I hope you have lots of fun playing this game and reading wonderful stories together, all while learning important math concepts! Do your kids love the Sir Cumference books? 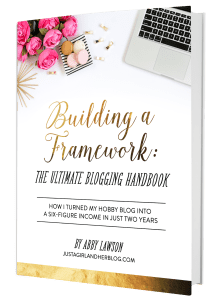 Check out this bundle, which includes lessons and games to use with the entire collection of books by Cindy Neuschwander! I also love using books with my math lessons. This activity is great! Thank you for the place value freebie! Great game. Our 5th graders will love this. Thanks for sharing. 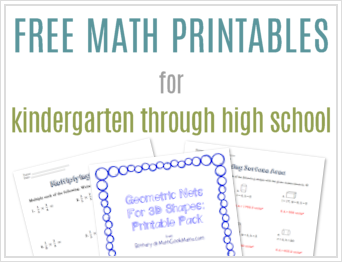 Thank you so much for sharing this wonderful resource- for Free!!! These activities look great. I can’t wait to share them with my class!